Known for its calming effects on the body, the Lavender Essential Oil can also help you make your skin flawless! Follow the read for some fantastic secrets to enhance your beauty! What’s purple and smells heavenly? Lavender it is! That’s right, the beautiful Lavender, as beautiful as it looks, that majestic is its scent. Even larger are its benefits on our health. Lavender by far is the most commonly used aromatic oil in the world. It is very widely used in aromatherapies and in spa like setting and it is done so for all the right reasons. I couldn’t agree more that the Lavender is gorgeously calming. Calming of the mind, the spirit, the soul, the body, everything! Lavender is the other name for the flowering plant LavandulaAngustifolia. It belongs to the genus Lavandula which belongs to the mint family. Lavender is also known for its distinct and vibrant color. It generally grows well and is cultivated in temperate climates. Lavender in Latin means ‘to wash’. It takes around 2 pounds of lavender flowers to make 1 ml of essential oil. Lavender essential oil is obtained by the process of distillation, steam distillation to be specific from the flowers of the lavender plants. The main constituents of this essential oil are- Linalool, a-terpineol, Linyl acetate, (E) b-Ocimene. 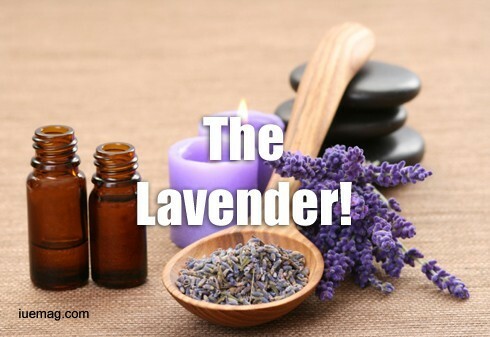 The Lavender essential oil is known for its distinct aroma and used widely for its calming and healing properties. Researches have proven that this oil is also beneficial for regenerative purposes and in establishing an emotional balance. Basically Lavender promotes healthy sleeping habits, it is said to have worked in calming the minds, therefore relaxing the body and you. So a sound sleep is what you’d in be in for by sniffing this oil. So how does sleep affect skin and hair? Good God! There is a big list of things that a good sleep especially the one at night can do for your skin and hair. Firstly, in the first two hours of the night’s sleep, your skin’s regenerative power is at its best, so you can imagine how much of repair and protect work would be going on in there. From enhancing your complexion, to giving you that glow to helping your hair glow, a good sleep does it all. It’s not for nothing they call it ‘Beauty Sleep’. Sunburns – Lavender essential oil is believed to relieve sunburn. All you have to do is, take a couple of drops and apply it to the affected area. Burns- Just like it helps soothe sunburns; any burn for that matter can be healed by this oil. The method of application is the same. Scars- This oil is believed to help scars diminish by promoting skin healing by regeneration. Blisters and wounds- This includes any cuts or blisters present on the skin by soothing the site, cleansing it and thereby helping it heal. It also helps in relieving teeth grinding and helps in the relaxation of the associated muscles. We all need some soothing environment at some point in our perfectly imperfect lives, don’t we? Lavender is probably the answer to it! Any facts, figures or references stated here are made by the author & don't reflect the endorsement of iU at all times unless otherwise drafted by official staff at iU. This article was first published here on 31st December 2016.